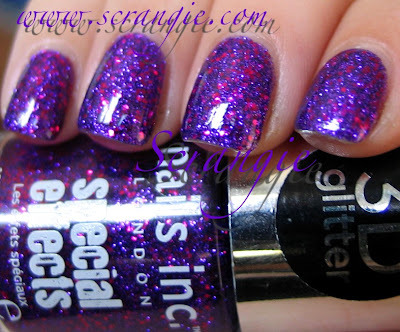 I've only tried three shades of the Nails Inc. Special Effects 3D glitter, but so far this one is my favorite. Even though the new Wet n Wild Ice Baby glitter nail polish in Back Alley Deals is an exact duplicate and less than half the price, I don't regret buying the more expensive Nails Inc. version. The color is worth it, and I love it so much that I would have purchased a backup anyway, so a $3 dupe is just icing on the cake. 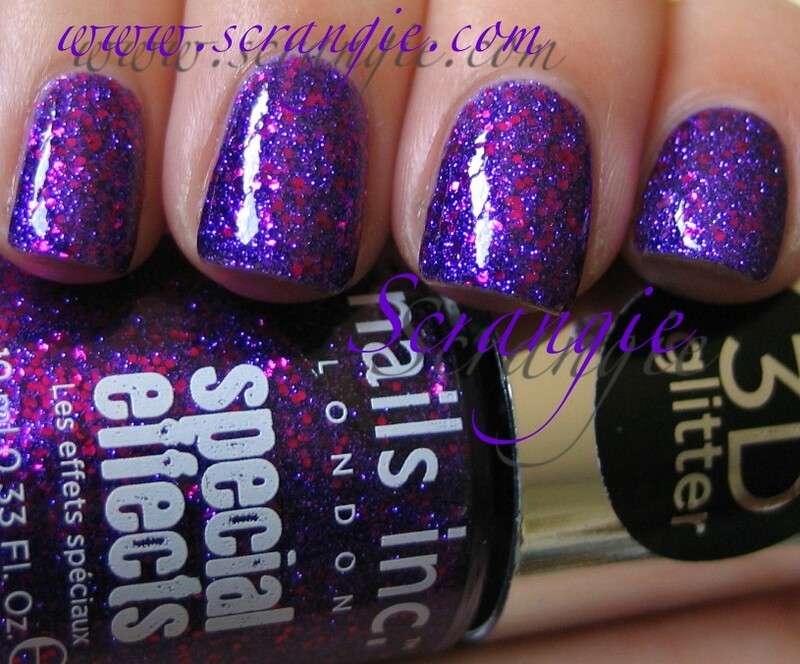 Nails Inc. Special Effects 3D Glitter in Bloomsbury Square. Three coats of polish, two coats of topcoat. This is a fine purple glitter and a larger, round magenta glitter in a clear base. 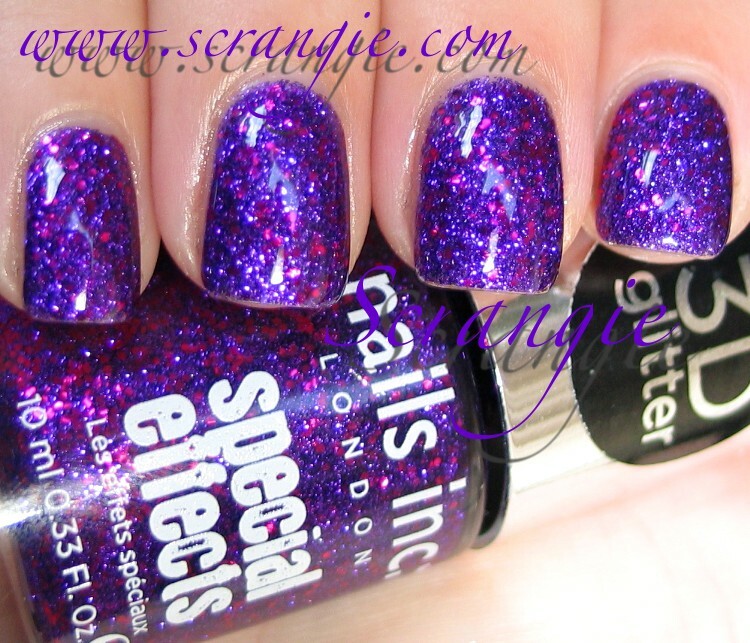 The purple glitter is very vivid and bright and the reddish circle glitter stands out against and at the same time amplifies the purple. I'm not sure what the '3D' refers to. The polish has two very different types of glitter so it has more depth than just a plain glitter, but it also dries to a very textured finish, which could also be the 3D part. I'm wearing it with topcoat here, but I also love how it looks without. It dries matte and gritty, but it looks gorgeous. Like superfine sugar, or colored sand. I neglected to take a picture of it in its matte form, but believe me when I say that it looks really cool. 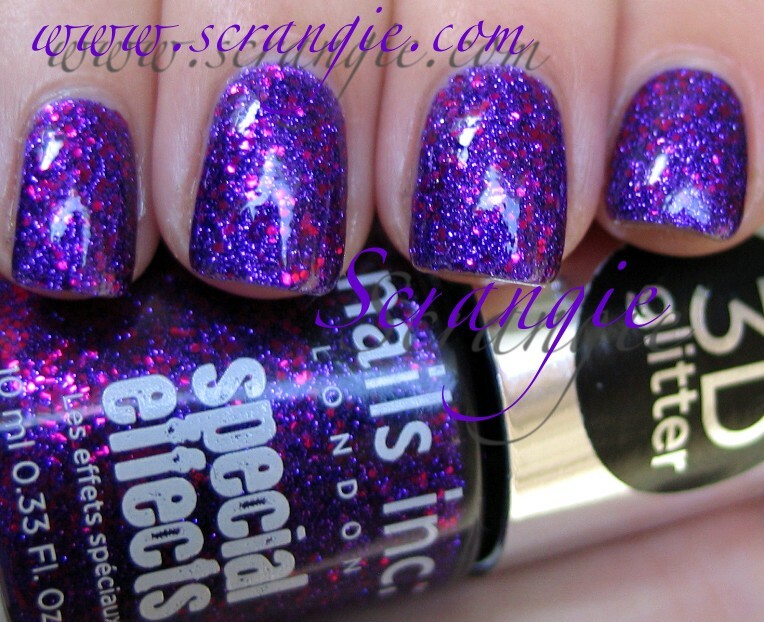 The formula on this was... glittery. It's very thick, but I didn't have too much trouble applying it. It was easy to do thin coats, and even doing three coats of this thick formula didn't cause it to get clumpy or look too thick on the nail. Drying time is surprisingly good even without topcoat. Wears very well, too. If you do use topcoat, be aware that this is really, really gritty. Not only does it require two coats to be even approaching smooth, but it eats topcoat as it dries. What I do with this is apply one coat of Gelous and one coat of Seche Vite right away. The next day, as it starts to become gritty again, I add another coat or two of Gelous on top and that makes it completely glassy smooth. Really love this. I love Connaught Square almost as much, but this is just too crazy purple for me to be able to love anything else more. That polish is so pretty! I loved it! Oh wow! I think I'm gonna swoon!! What a stunning polish! And it's good to know that there's a cheaper alternative...although I don't think I'll be able to find the alternative here in Canada! I know that I've said it before, but whatever...I really like your nail shape - so pretty, Scrangie! I have this one and Sloane Square. I am wearing Sloane Square right now, and I cannot wait to try this one as well!